The 26th NC recently completed the fund-raising for its eigth such banner and, has begun work on its next preservation project, the 1862 Headquarters Flag of General Lawrence O'Bryan Branch. This flag is the first pattern of the Confederate National Flag with the words "Gen. L. O B. Branch - 1862 - NC" embroidered on the canton. It was Left behind in Winchester Virginia during the retreat of the Confederate Army of Northern Virginia from the Maryland Campaign and after Branch's death at Sharpsburg. The flag was returned to the State of North Carolina and the Hall of History on September 21, 1920. The Society for the Historical Preservation of the 26th Regiment North Carolina Troops, Inc. & The North Carolina Museum of History have entered into a unique partnership to save North Carolina's Civil War Artifacts. 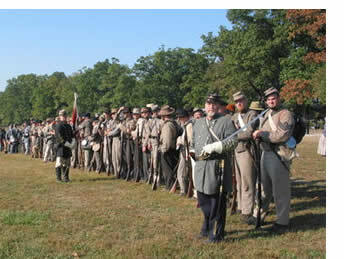 From its inception, the mission of the 26th NCT has been to perpetuate the history of the original 26th NCT and the State of North Carolina's role in the American Civil War. We have always held to the belief that it is of the utmost importance that we preserve our ancestors' artifacts and monuments for future generations of North Carolinians. Since 2004, the Regiment has raised $234,154 for historical preservation, battlefield preservation, artifactloans and monument placement. 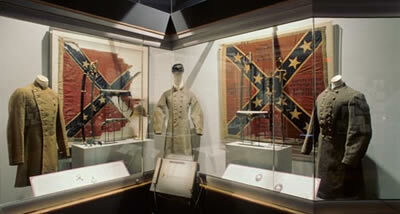 The North Carolina Museum of History (NCMOH) holds an impressive collection of North Carolina Civil War flags and uniforms. Many of these artifacts need extensive conservation before they can be exhibited. Textile conservation is a time consuming, specialized, and expensive task, as hundreds of hours are needed to stabilize just one flag or uniform. With State funding not available to restore these artifacts, it is imperative that we all step up to help. Help Preserve North Carolina's Civil War History. Please note, that one hundred percent (100%) of all donations will go towards the conservation project. Once this project is completed a special ceremony re-dedicating the Headquarters Flag of General Branch will be held at the NC Museum of History. All who donated to the project will be notified of the date and time so that you may be a part of this special day.